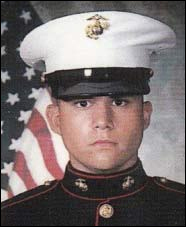 Gunnery Sergeant Christopher Claude enlisted in the United States Marine Corps during his senior year of high school in 1997, and entered Marine Corps Recruit training at Parris Island, South Carolina in 1998. He attended Field Artillery Radar Operators Course in Fort Sill, Oklahoma, and reported to his first duty station with 11th Marines in Camp Pendleton, California, as a field artillery radar operator. He became a field artillery radar team leader, and immediately after the September 11 terrorist attacks, Gunnery Sergeant Claude reenlisted and was assigned as a recruiter with Recruiting Station Sacramento for three years. He returned to Camp Pendleton as the Assistant Field Artillery Operations Chief for 2nd Battalion 11th Marines in June of 2005. He was selected to deploy as a member of a Military Transition Team in September 2005. On February 20, 2006, while on a vehicle mounted patrol, Gunnery Sergeant Claude and his team where ambushed 300 yards from the Iraqi battalion headquarters near Al-Hindiya, Iraq, where they were embedded. The attack consisted of a deadly IED called an explosively formed projectile (EFP) designed to penetrate the armor of US Military vehicles. Their Humvee sustained catastrophic damage to its front and was then thrown into a drainage canal. Gunnery Sergeant Claude was in the gunner’s position and sustained life-threatening injuries, while the driver, Staff Sergeant Jay Collado, was killed on impact. Also in the vehicle and suffering severe injuries were the vehicle commander, 1st Liutenant Justin Waldeck and Iraqi interpreter Safa Al Iqabi. Gunnery Sergeant Claude attributes his survival to the quick actions of the team’s Navy Hospital Corpsman Geoff “Doc” Hunley for saving his life by holding his femoral artery closed by hand while they waited nearly 90 minutes for a MEDIVAC helicopter to arrive. He was taken to the E.R., where he went through nearly 70 units of blood, and suffered the collapse of both lungs. Additionally, he suffered a traumatic partial amputation of his left thumb, a multitude of broken bones, fasciotomies in his left leg and left arm that subsequently caused nerve damage, as well as burns and shrapnel wounds in his abdomen requiring exploratory surgery to remove, and a traumatic brain injury. Gunnery Sergeant Claude was transferred to Landstuhl Regional Medical Center in Germany where he underwent the amputation of his right leg above the knee due to infection and would later need to be resuscitated. He was given a 40% chance of survival, but would stabilize three days later and be transferred to Bethesda Naval Hospital, where he spent 10 days in the ICU and another 2 months undergoing surgeries. Gunnery Sergeant Claude was then transferred to Brooke Army Medical Center in San Antonio, Texas, to complete his physical rehabilitation. In addition to having to cope with the trauma of combat, Gunnery Sergeant Claude needed to adjust to life with his new disability. It did not take him long to find new passions in both disabled sports and mentoring disabled peers. Chris was determined to not let his disability define who he is. He is an avid hand-cyclist, having completed eight marathons to date, and plays sled hockey, enjoys kayaking and sit-skis in the Pocono Mountains where he now resides with his wife, Shirley, and three children. In addition to his participation in disabled sports, Chris attended college and received his bachelor’s degree in business management in 2014, and is currently pursuing his master’s degree. 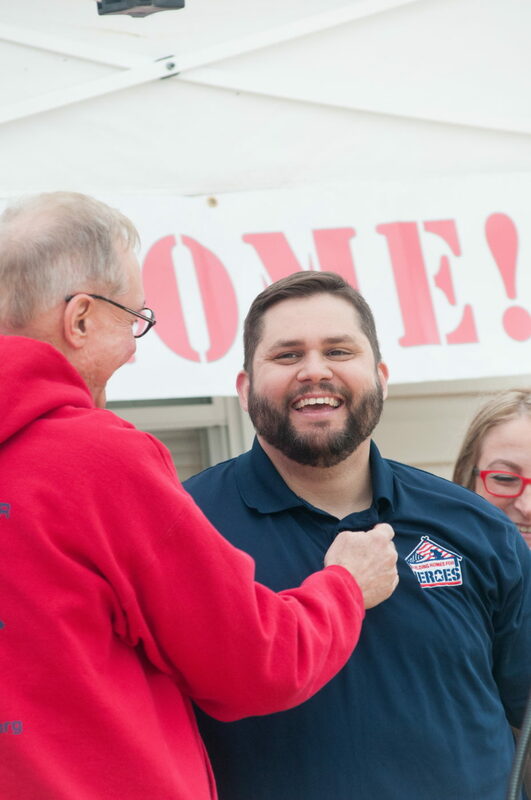 Today Gunnery Sergeant Claude and his family are looking forward to receiving a home that has been specifically modified for his needs and will give him the opportunity to completely regain his independence. His “forever home” will give him the ability to be independent for many years to come. 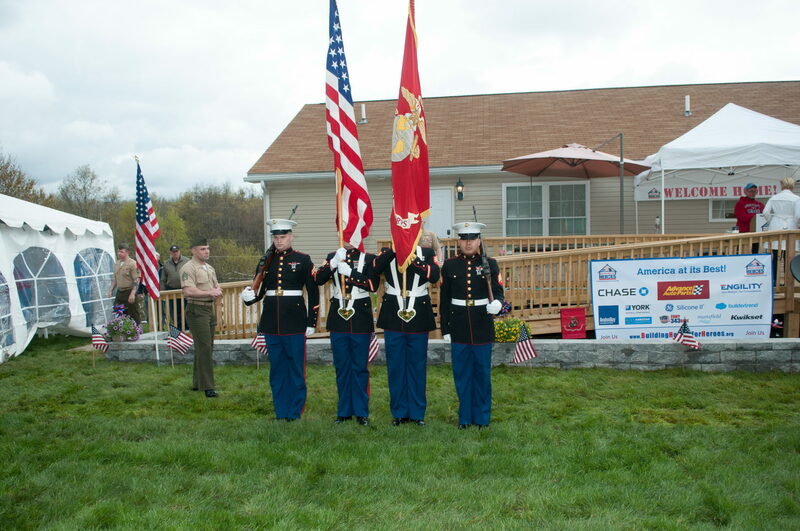 Thank you to Engility Corporation for hosting their 3rd Annual TVETS Charity Charity Golf Tournament to benefit Building Homes for Heroes on Oct. 26, which raised $20,000 for the home of USMC Gunnery Sgt. Christopher Claude.